Food makes a wonderful gift, and is sure to please friends and family – both now and a hundred years ago. 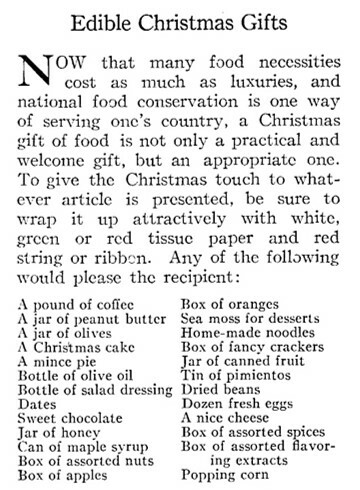 But, I must admit that some gift suggestions on a hundred-year-old list of edible gift ideas don’t work for me. Why the heck would someone want edible moss for desserts? The article suggests wrapping the edible gift in tissue paper. The food could also be put in boxes. When giving a gift of candy a century ago, people often made decorative gift boxes. 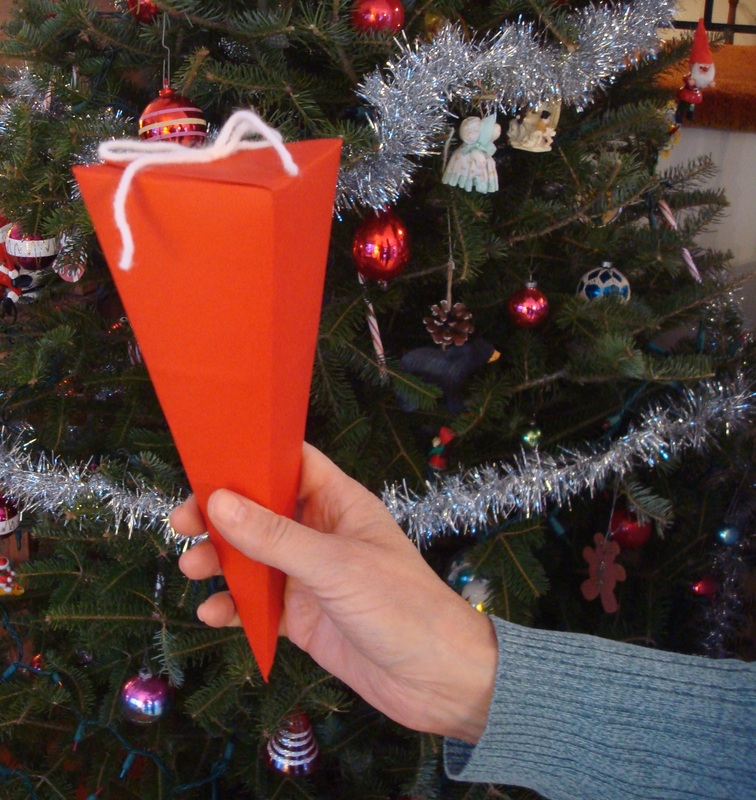 Several years ago, back when I was posting my grandmother’s diary, I did a post on how to make a triangular candy box. The directions originally appeared in the December, 1912 issue of School Arts Magazine. We are so lucky today that these items are no longer scarce or expensive. I agree – This short magazine article provides a window into how tight money was for the typical family a hundred years ago. My stocking always had an orange, an apple, and some nuts in the shell along with other little gifts. And a nut bowl with a nut cracker always was the centerpiece of the coffee table. We’d sit and crack nuts, while my folks told stories of how exciting it was to get real oranges, apples, and nuts at Christmas. I also have good memories of the nut bowl with a nut cracker. When I was a child, I got tangerines in my stocking – though it seemed a bit silly since there were always lots of additional tangerines in the refrigerator in the kitchen. I guess that suggests that fruit in Christmas stockings was more of a treat when my parents were young than when I was young. After sea moss for desserts, a food I know nothing about, I’d say a tin of pimientos, while useful, is the one that surprises me the most on this list. This is a fascinating glimpse into the past. It is intriguing – Pimiento must have been more popular back than than what it is now. It’s great to be reminded that simple gifts can be cherished and appreciated. In some ways, it makes me long for days when simple gifts were more popular than what they are now. I love this! you find the best things to share with us! It wonderful to hear that you liked this post. I have a lot of fun doing this blog and it’s nice to hear when someone enjoys the posts. It’s interesting how some of those items would still be considered nice gifts now and others . . . not so much. I love the candy box! I was pleasantly surprised by how nice the candy box turned out. I would be happy with a mince meat pie. I wonder if the sea moss was a specialty because of its thickening abilities … as in custard like desserts. Maybe – I have vague memories of McDonald’s using sea weed as a thickener in milk shakes years ago. Hi Sheryl – how timely! I’ve been thinking about edible gifts. I truly do not like “hunting” for gifts or giving gift cards. Edible gifts are the perfect thing. I was thinking about giving spiced nuts, but I like the first thing on the list you shared: a pound of coffee! I would think the sea moss would be agar-agar which is used in place of gelatin. It is a non animal source for those who don’t eat animal products. That makes sense. I never would have thought of agar-agar. Thanks!